Mercedes is offering many self-driving technologies in the new E class. MUNICH (Bloomberg) -- Mercedes-Benz's overhaul of its lineup is coming full circle as the E class goes on sale this month, testing the automaker's ability to maintain its growth pace. 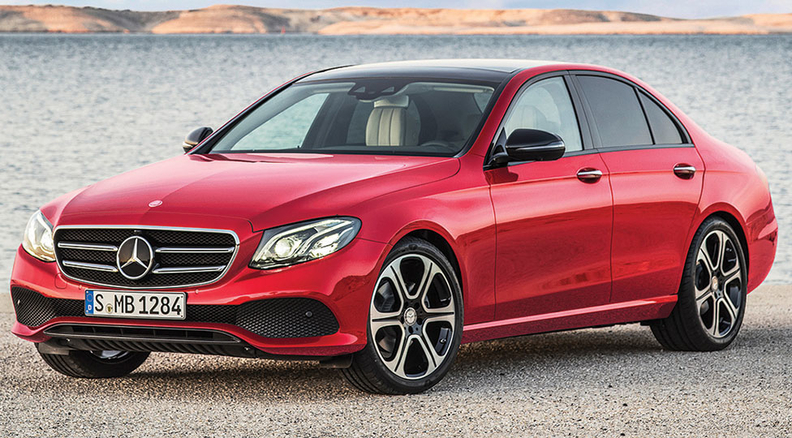 After revitalizing the brand starting with the A class in 2012, the makeover has now run through Mercedes's major models. The next sales-boosting loop of vehicle revamps won't get going until 2018, when Mercedes will also face stronger competition as BMW Group and Audi rejuvenate their own lineups. February was a reminder of how close the race between the three can be, with BMW ahead in global sales for the month. "They won't be able to keep this momentum going forever," said Juergen Pieper, a Frankfurt-based analyst with Bankhaus Metzler. "The novelty effect is going to start to wear off, and we expect sales growth to slow down from mid-2017." Mercedes has continued to reap the benefits of its redesign. Even with BMW outselling Mercedes in February, the company is on track to overtake the current luxury-car market leader in 2016, four years ahead of its target. It had 284,566 deliveries so far this year compared to the BMW namesake brand's 277,304. Audi fell further back into third place with deliveries of 269,650 through February. "In the last 10 years, our and my objective within the traditional sphere of business was to improve our competitiveness," Daimler CEO Dieter Zetsche said at an E class test drive in Portugal this month. The goal is "perhaps not accomplished, but pretty close." The cycle started in 2010 with the decision to make Mercedes vehicles sportier and sleeker. A year later, Zetsche said the brand would try to regain the luxury-car top spot it lost in 2005. The goal seemed a stretch at the time as the brand slumped to No. 3 that year. The first fruits of the resurgence came with the presentation of the sporty new A-class compact sedan at the Geneva auto show. The car broke with its predecessor's boxy design, which had failed to attract the young audience it sought. Then came 2013's revamped top-of-the-line S class, which is still selling more than twice as many vehicles as the latest BMW 7 series introduced in October. Finally, this year's new version of the brand's mainstay business sedan, the E class, is packed with the latest self-driving features. Zetsche, CEO since 2006, has promised a product portfolio of about 40 new or revamped models, including a dozen all-new vehicles, by the end of the decade. That leaves about 10 cars without predecessors left to introduce, the company said this week. There are limits to that expansion. Mercedes isn't planning a competitor for Audi's new Q2 subcompact SUV, Mercedes sales chief Ola Kaellenius said this month. Daimler flagged last month that it will be a struggle to maintain the growth rates it enjoyed last year. It said profit from carmaking will grow "slightly" this year, in a range of 5 percent to 10 percent, in contrast to 2015's 40 percent surge. Beyond building new hardware, Zetsche said Mercedes needs the best new technology to be in pole position against a new set of automotive contenders such as Tesla Motors Inc., Apple Inc. and Uber Technologies Inc.
At last year's Consumer Electronics Show in Las Vegas, Mercedes stole the spotlight with an autonomous concept car outfitted as a rolling luxury lounge, with swivel seats and a retractable steering wheel. "Now it's about widening the scope and seeing a much wider kind of competition and setting the direction for the company to thrive for the next 100 years," Zetsche said in Portugal. "It's an extremely critical time right now, and I'm happy we can address this time from a position of strength."